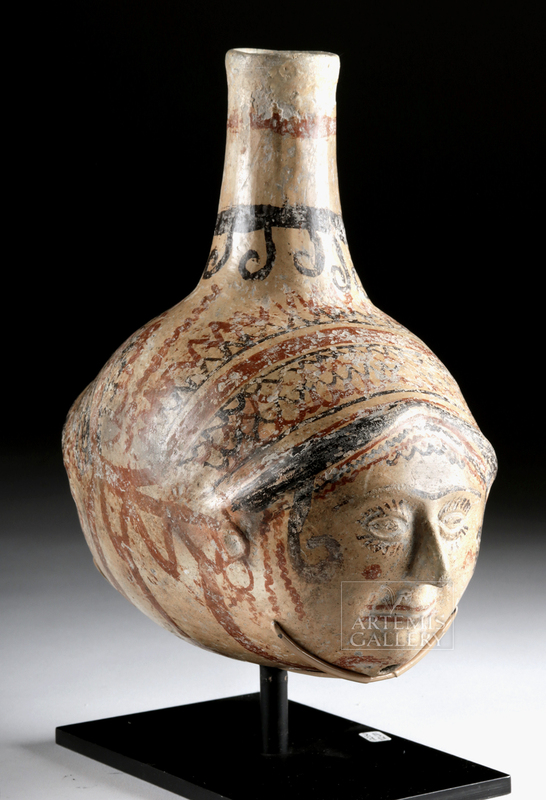 East Greek, Anatolian (Phrygian), ca. 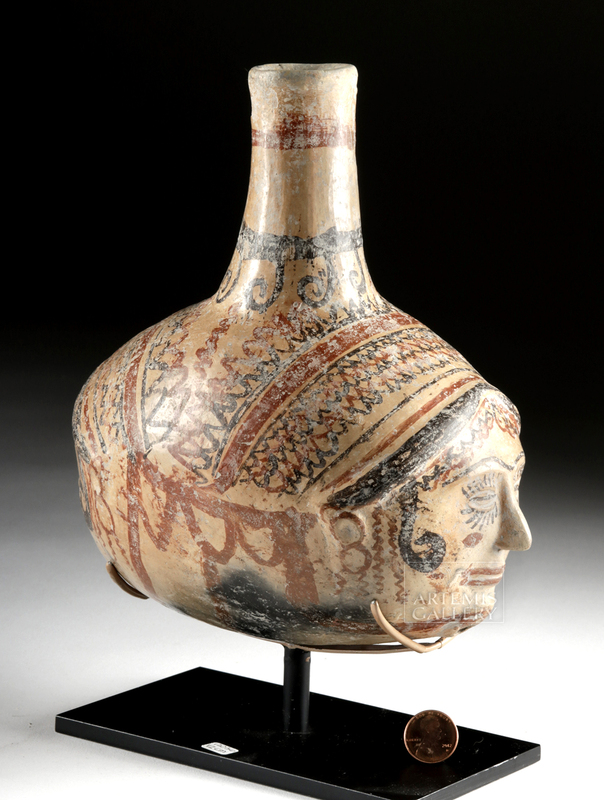 7th to 6th century BCE. 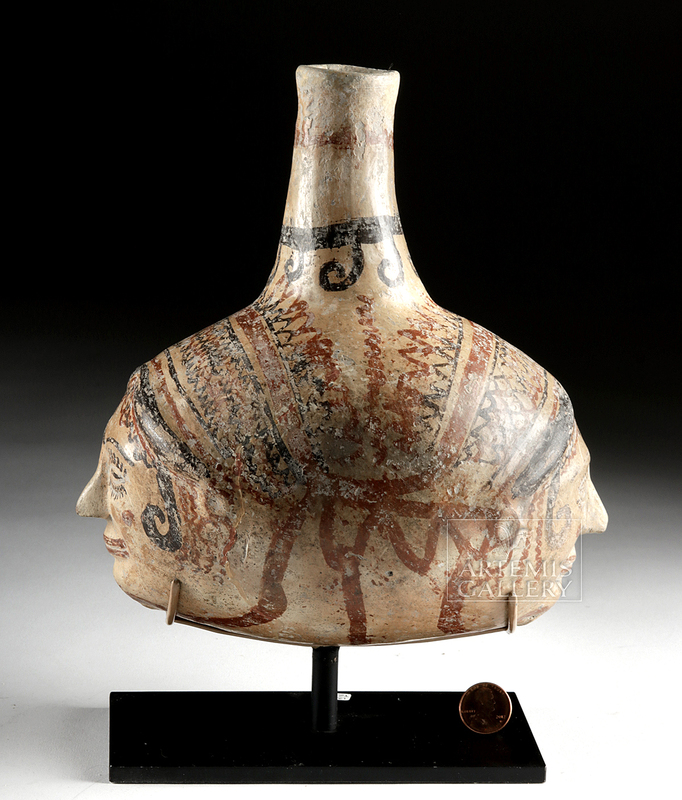 A very rare polychrome terracotta vessel presenting nearly identical female faces one either side of the ovoid body with a central tubular spout. 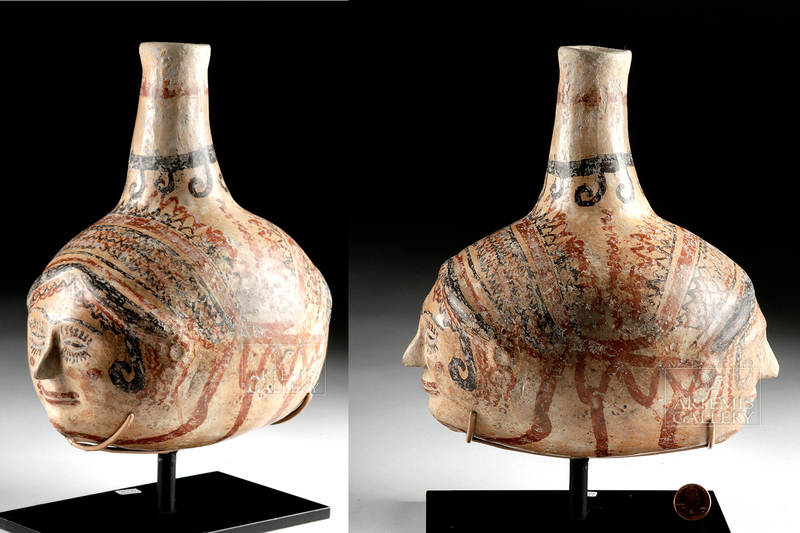 Bull heads are far more familiar on Phrygian pottery. One female visage, let alone two, are much more unusual! Each visage is skillfully modeled with a crested forehead, articulated eyes, a protruding nose, gently contoured cheeks, low-relief closed lips, and a delicately rounded chin. Furthermore, the details are delineated with fine-line painting and a rich color scheme. Just look at those long eyelashes, that slender browline, those crimson red circles marking her cheeks, lips of the same hue, black curlicue locks of her coiffure falling down each side of her face, as well as that magnificently detailed hairnet in crimson and black. Size: 7.125" L x 4.625" W x 8.375" H (18.1 cm x 11.7 cm x 21.3 cm); 9.75" H (24.8 cm) on included custom stand. In addition, the tall spout has a horizontal red band near the lip and a black band with curls near its base. What's more, the sculptor made a perforation beneath the chin of each face. Evidently this piece was used to make libation offerings that would run through the vessel. Phrygia was a kingdom in the west central part of Anatolia, in what is now Turkey, centered around the Sakarya River. The Phrygians are most famous for their legendary kings of the heroic age of Greek mythology: Gordias whose Gordian Knot would later be untied by Alexander the Great, Midas who turned whatever he touched to gold, and Mygdon who warred with the Amazons. Cf: Urartian wide-mouthed jar with three similar molded female faces in the Museum of Anatolian Civilizations, Ankara, inv. 23008, published in "Art Treasures of Turkey" (Washington, DC, 1966), cat. No. 88, p. 83. Condition: Normal surface wear with some abraded areas and pigment loss commensurate with age. One face was reattached with one piece of the visage reattached to it and possible restoration over the break lines. Both noses were restored. Otherwise very good with nice remaining original painted details.